These winter tips might sound simple and obvious, but you would be surprised at how many people forget to have them done. it doesn’t matter if it’s a newer home or an older home these winter tips are important. Winter tip #7 is to install a fresh furnace filter and have the furnace, with all its associated components service by a licensed HVAC professional. Winter is just about here. 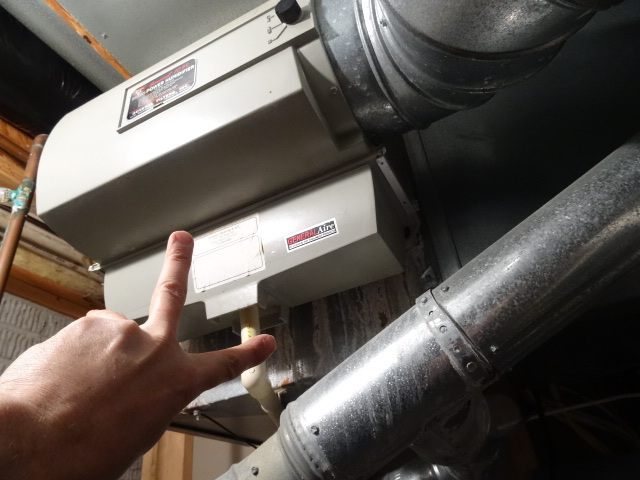 A failing furnace and big bills to operate and repair it are not pleasant things to endure. Annual service can prevent or catch items that need attention before they become bigger problems during the winter months. Here are a few examples. 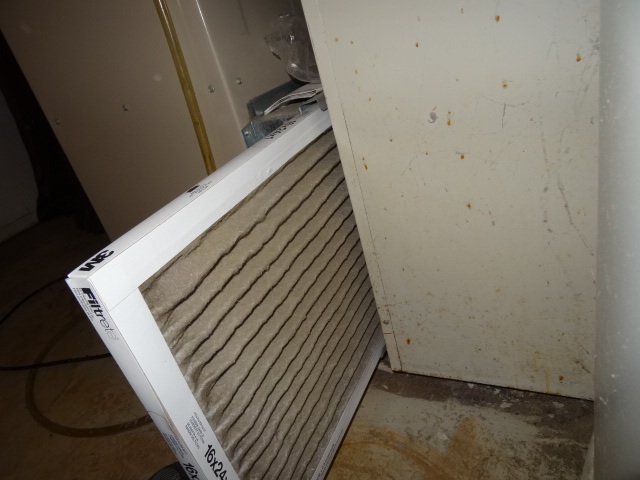 If your furnace filter looks like this, you probably should get a new one installed right now. Don’t let your filter get to this point. Not only are you reducing your efficiency, but you also may cause the heat exchanger to deteriorate or fail prematurely. A clogged filter reduces the amount of air passing across the heat exchanger causing it to run hotter than it would under normal conditions. Reducing the amount of air circulating through the system means that it will take longer for the air in the home to be conditioned which increases your utility bill. If you haven’t pulled the front cover off of your furnace in a couple of years, it may look like this one. 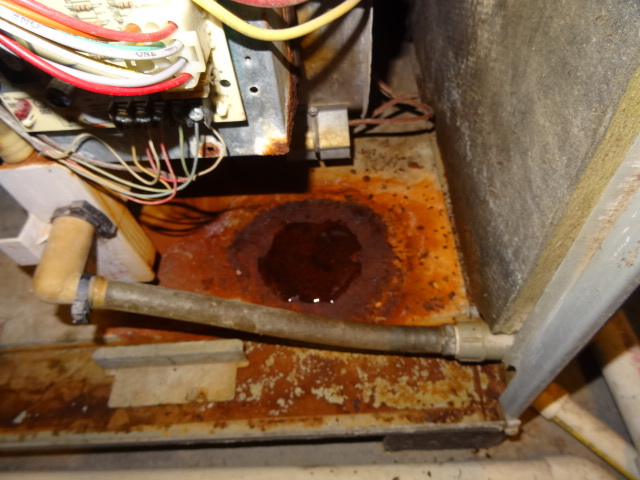 An active condensate leak can damage the furnace as well as creating conditions conducive to mold growth. Having the unit serviced won’t prevent this from happening but might catch it early so that it can be repaired before causing this amount of damage. If you have an air exchanger, have it serviced! These require periodic maintenance in order to operate efficiently and correctly. This should be performed at your annual HVAC service check up. A lack of service on your air exchanger is worse than not having one in the first place if you ask me. Last but not least. Service your humidifier if you have one. These require annual service and replacement of the media inside the unit. 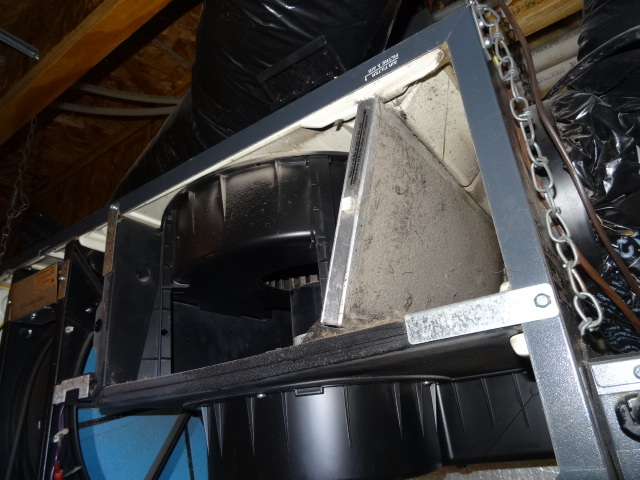 If this is not changed, you may experience mold growth on the inside of the unit which will then be distributed throughout the home via your supply side ducts. I hope these tips are helpful for you and that you will share them with your friends on social media.